You read the title correctly. This is a Christina Tosi recipe and I surmise this pie and the real thing have a fair amount in common. The addictive quality, thinking about it when you shouldn’t be, and wondering when you’re going to get it again are likely common themes for both. I can say definitely that all rings true with regard to crack pie. Like all of Christina’s recipes, there are multiple steps and recipes within recipes but the results were worth it. First, let’s talk about the crust. It’s starts as a sheetpan-style giant oatmeal cookie slab that’s made from butter, brown and white sugar, an egg yolk, flour, and oats. The big cookie slab is spread about 1/4- inch thick onto a sheetpan, baked for 15 minutes, cooled, and then destroyed. That’s right, after cooling, the cookie is crumbled up with a bit more brown sugar and more butter, and packed into a pie plate as the crust. After packing the crust in, I made the filling, halving her recipe for the filling. I made the full amount of cookie (crust) because the extra was easily tossed into lunches and gobbled as snacks but I didn’t need two whole pies laying around so halved the filling amount to make “just” one pie. Too much temptation being around that much Crack otherwise. 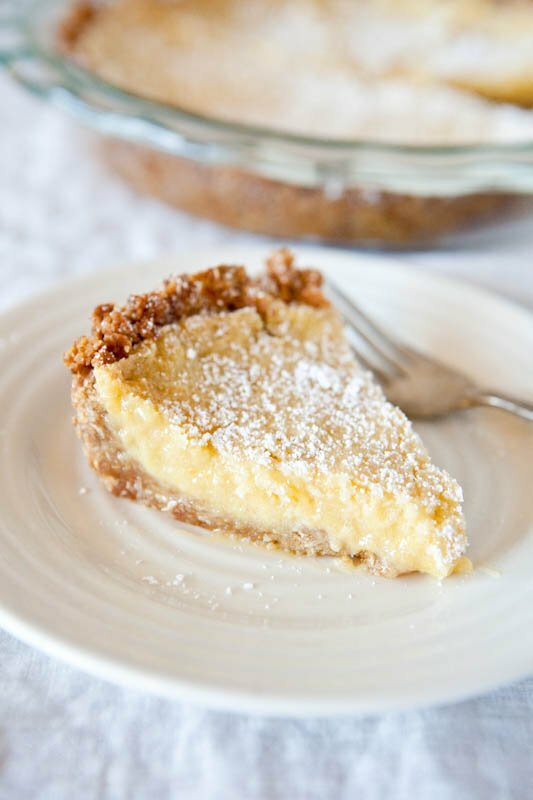 The filling is made with heavy cream, 4 egg yolks for each pie filling (8 in the full recipe) vanilla extract, white and brown sugar, milk powder, and she also called for 1/4 cup of corn powder (finely pulverized corn flour, not corn starch). across two pies. Because I was halving it, this meant 1/8th cup or 2 tablespoons corn powder and rather than ordering or sourcing it at Whole Paycheck, I simply used 1 1/2 tablespoon King Arthur all-purpose flour and things turned out just fine. It must be all the sugar and fat in this pie that kept me from missing those two tablespoons of corn powder because there is so much (butter) going on already. Butter in the cookie to make the crust, then more butter adding when crumbling and packing the crust down into the pie plate, more butter in the filling. And I sure wasn’t complaining. I found myself digging my fork into the pieplate to just “even out the pieces” and then whoops it’s not even, better have another bite and then whoops it’s 12:32am and I can’t stop thinking about this pie, better go see what my own version of crack is up to. If you are not a fan of sweet desserts, this is not for you. 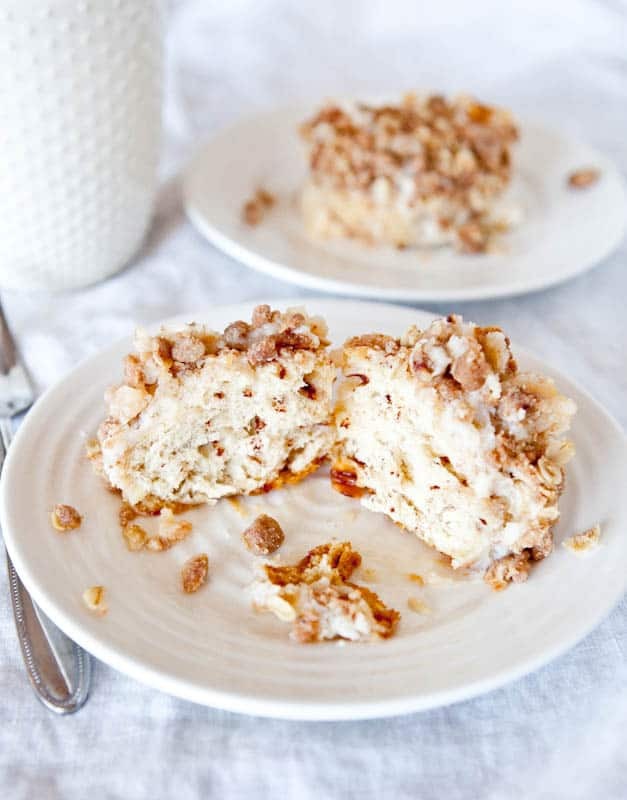 If you are not a fan of fatty, buttery, rich desserts, this is not for you. If you’re not a fan of either of those things, you’re reading the wrong blog anyway. 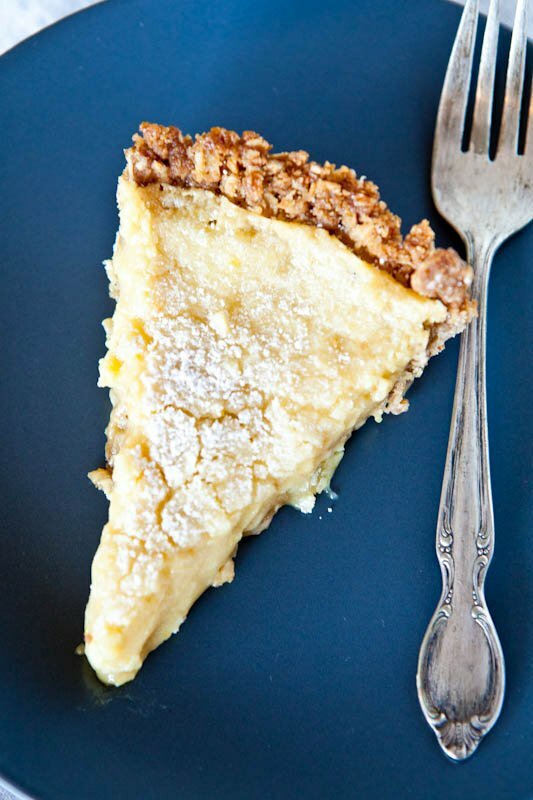 There’s a reason that Momofuku Milk Bar sells these pies for $44 each. Not to mention few hours worth of time and lots of labor and dishes. I had every sheet pan, mixing bowl, spatula, and measuring cup I own dirtied up for this pie. Would I make this again? Yes, definitely and with the changes I noted in the recipe section. I’d even consider using a store-bought graham cracker crust and just making the filling because that’s very do-able and not too time-consuming for the average person trying to juggle life, family, work, school, and not spend 3 hours in the kitchen to make one dessert. Each bite is crack-like, indeed. I can only imagine the Google search hits my site is going to get after this post. 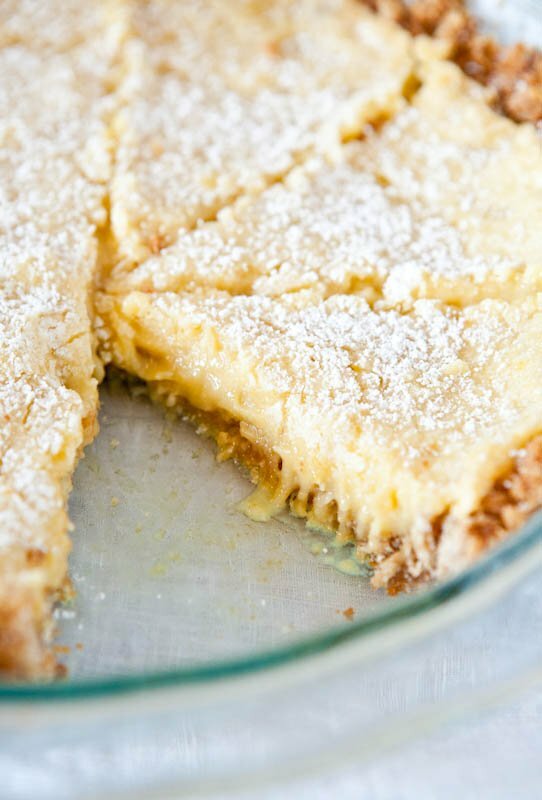 The recipe lives up to its name and everyone should try this pie at least once. It’s a fairly involved recipe from Christina Tosi’s Momofuku Milk Bar cookbook, as are all her recipes. I wrote extensively in the blog post about the changes I made to the recipe and what I would do in the future. Make sure to thoroughly read the post and recipe a few times before beginning. To prepare the Oat Cookie crust, preheat the oven to 350°. In a stand mixer with a paddle attachment, cream butter and sugars on medium-high for 2 to 3 minutes until fluffy and pale yellow in color. Scrape down the sides of the mixing bowl with a spatula. On a lower speed, add the egg to incorporate. Increase the speed back up to a medium-high for 1 to 2 minutes until the sugar granules fully dissolve and the mixture is a pale white color. On a lower speed, add the flour, oats, baking powder, baking soda, and salt. Mix 60-75 seconds until your dough comes together and all remnants of dry ingredients have incorporated. Your dough will still be a slightly fluffy, fatty mixture in comparison to your average cookie dough. Scrape down the sides of the mixing bowl with a spatula. Pam spray and line a quarter sheet pan with parchment or a Silpat. Plop the oat cookie dough in the center of the pan and with a spatula, spread it out until it is 1/4″ thick. The dough won’t end up covering the entire pan, this is okay. Bake the oat cookie for 15 minutes. Cool completely before using in the crack pie recipe. To prepare the pie filling, mix the dry ingredients for the filling using a stand mixer with a paddle attachment on low speed. 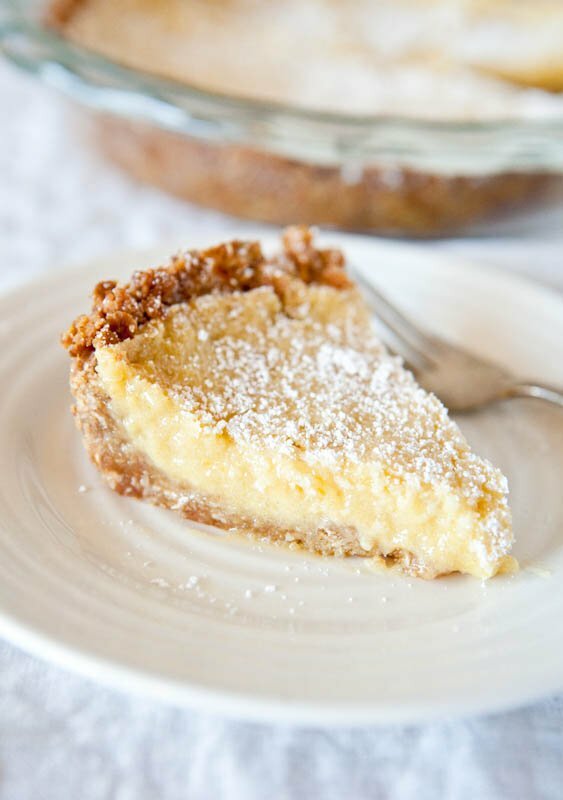 Be sure to keep your mixer on low speed during the entire process of preparing the filling; if you try to mix on any higher than a low speed, you will incorporate too much air in the following steps and your pie will not be dense and gooey – the essence of the crack pie. Add the melted butter to the mixer and paddle until all the dry ingredients are moist. Add the heavy cream and vanilla and mix until the white from the cream has completely disappeared into the mixture. Scrape down the sides of the bowl with a spatula. Add the egg yolks to the mixer, paddling them in to the mixture just to combine. Be careful not to aerate the mixture. Use the filling immediately. To assemble the pies, preheat the oven to 350°. Put the oat cookie, brown sugar and salt in the food processor and pulse it on and off until the cookie is broken down into a wet sand. (If you don’t have a food processor, you can fake it till you make it and crumble the oat cookie diligently with your hands.) Transfer the cookie crumbs to a bowl and, with your hands, knead the butter and ground cookie mixture until the contents of the bowl are moist enough to knead into a ball. If it is not moist enough to do so, gently melt an additional 1-1 1/2 tablespoons of butter and knead it into the oat crust mixture. 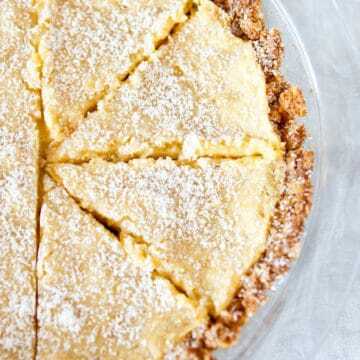 Divide the oat crust evenly over 2- 10″ pie tins. 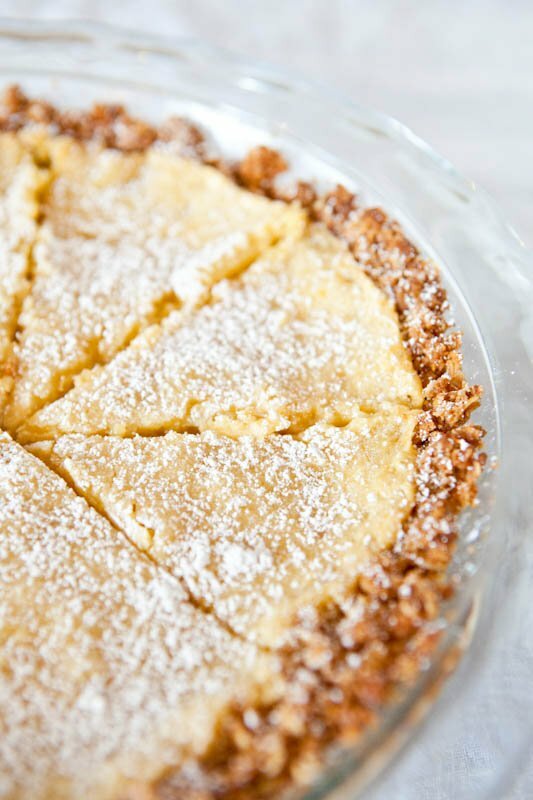 Using your fingers and the palm of your hand, press the oat cookie crust firmly into both 10-inch pie shells. Make sure the bottom and the walls of the pie shells are evenly covered. Use the pie shells immediately or, wrapped well in plastic, store the pie shells at room temperature for up to 5 days or in the fridge for up to 2 weeks. Place both pie shells on a sheet pan. 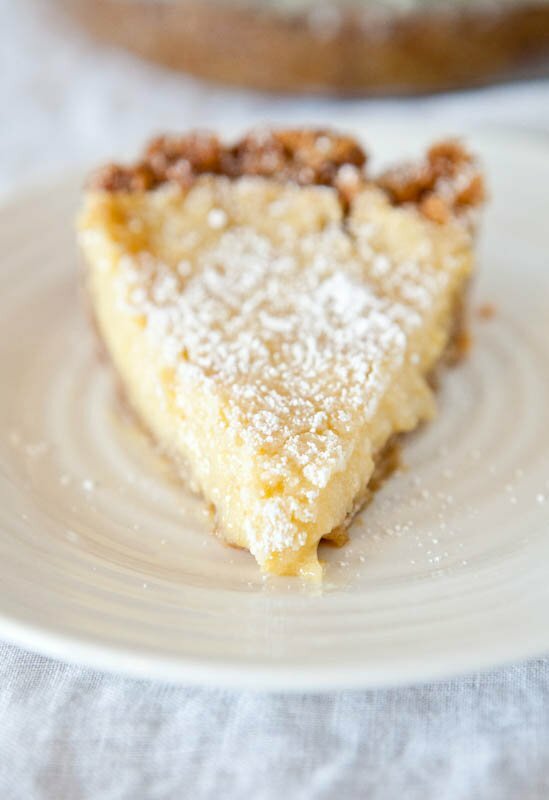 Divide the crack pie filling evenly over both crusts (the filling should fill the crusts 3/4 way full) and bake at 350° for 15 minutes. During this time, the crack pie will still be very jiggly, but should become golden brown on top. At 15 minutes, open the oven door and reduce the baking temperature to 325°. Depending on your oven this will take 5-10 minutes – keep the pies in the oven during this process. When the oven temperature reads 325°, close the door and finish baking the pies for 5 minutes. After 5 minutes, the pies should still be jiggly in the bull’s eye centers, but not in the outer center circle. If the pies are still too jiggly, leave them in the oven an additional 5 minutes. Gently remove the baked pies from the oven and transfer to a rack to cool at room temperature. You can speed up the cooling process by transferring the pies to the fridge or freezer if you’re in a hurry. 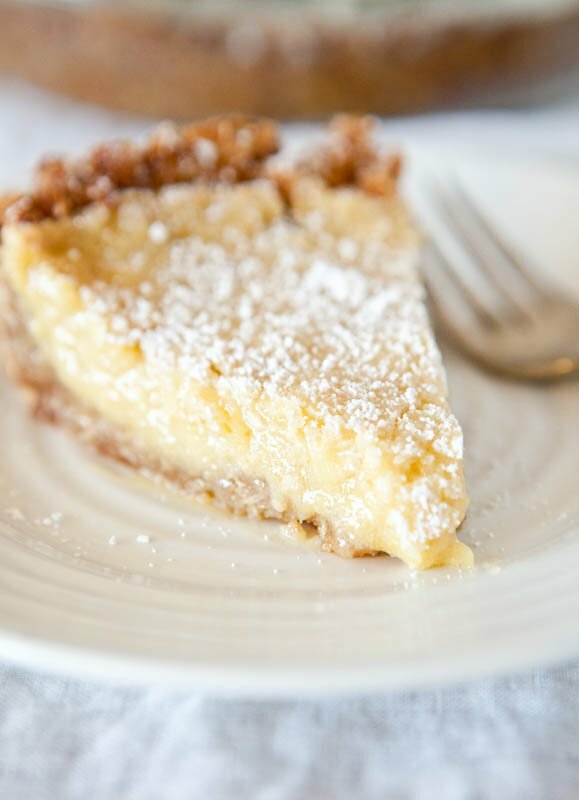 Freeze your pie for as little as 3 hours or up to overnight to condense the filling for a dense final product – the signature of a perfectly executed Crack Pie. Just before serving finish with a dusting of confectioners’ sugar. I would use a 9-inch, not 10-inch, pie plate as she recommends. I felt it was just “barely” enough filling and don’t attribute it to halving the recipe. I also used more than half the cookie for the crust and feel a 9-inch would be better. I would underbake the cookie crust by about 25-30% of what she recommends (take it from 15 minutes to about 10 minutes) so that it crumbles easier and packs into the pie plate easier; plus it gets baked a second time anyway as part of the pie. 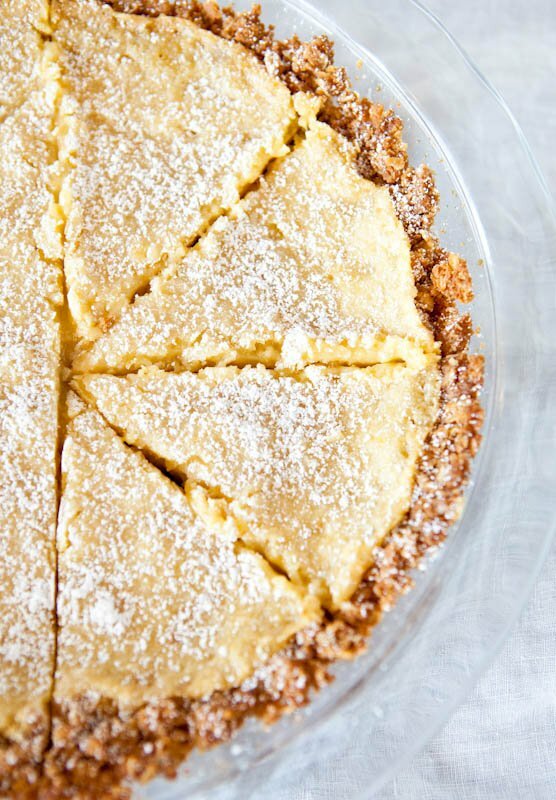 I would consider buying a store-bought graham cracker pie crust and just making Christina’s filling if I wanted to take this recipe from 2 hours of standing on my feet to 15 minutes by just making the filling. I didn’t miss the corn powder and would continue to use my 1 1/2 tablespoons of all-purpose flour because I am frugal, didn’t want to source it, and don’t want to store a bag of corn powder in my already maxed out cupboard space for the occasional one tablespoon use of it. Tosi recommends baking the entire pie, crust and filling together, for 15 minutes at 350F, opening the oven door and allowing the oven to cool to 325F, and then baking for about 5 more minutes after the oven temperature has reached 325F (about 20-25 minutes of total baking time). I needed to bake mine for about 31-34 minutes of total baking time in order for the center to set (at least one-third longer than she called for which is highly significant and to be noted). Also I was only baking one pie; if I had two in the oven, it would have taken even longer. Here’s a 5 minute video of Martha Stewart visiting Momofuku Milk Bar. 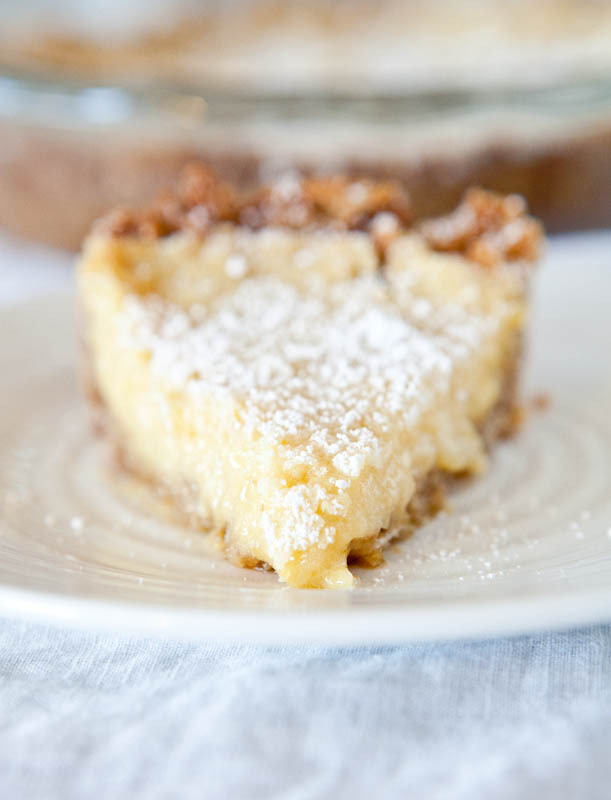 The video quickly shows a variety of their desserts and in the second half of the video, Christina and David make Crack Pie (in two minutes!) for Martha. It was fun to watch them cooking, hear their voices, see their technique and I watched this before I made my Crack Pie and it was immensely helpful. A picture (or video) is always worth a thousand words. This post is part of my participation in the Milk Bar Monday’s Group. My last post with the group was Cinnamon Bun Pie, which I took ample shortcuts for and this doughy hot mess is a 15 minute project, tops. 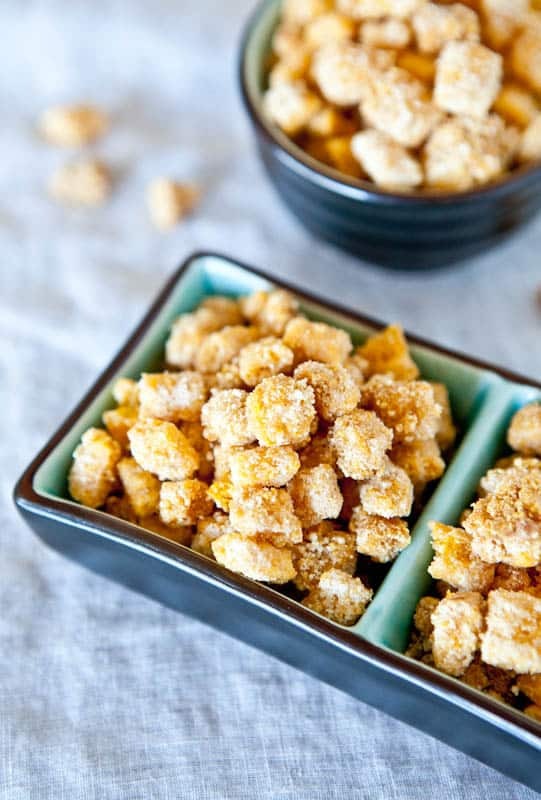 My most recipe inspiration from Christina Tosi was my Buttery Toasted Captain Crunchies. She makes something similar with Corn Flakes, or Fruity Pebbles, and I tweaked her recipe and used Cap’n Crunch. They taste like buttered toast much more so than Cap’n Crunch, are uber crunchy, and highly addictive. Do you make your own crust? Do you have a favorite crust or filling recipe? I am more of a fan of pie filling than whole pies, because most crust because tends to be boring and dry and don’t prefer to consume dry and boring calories. When I think of pie, this caramel maple pumpkin smoothie tastes like pumpkin pie filling. All the “good” parts and flavors of pumpkin pie, no dry crusty parts involved. These caramel apple bars (gluten free) or caramel peanut butter and jelly bars (gluten free) are my idea of apple “pie”. The crust is flavorful, moist, there’s peanut butter involved, and it’s a one-pan, ten minute project. One of the reason I don’t make pies is because they are cumbersome and secondly I am take-it-or-leave-it with most pie crust. 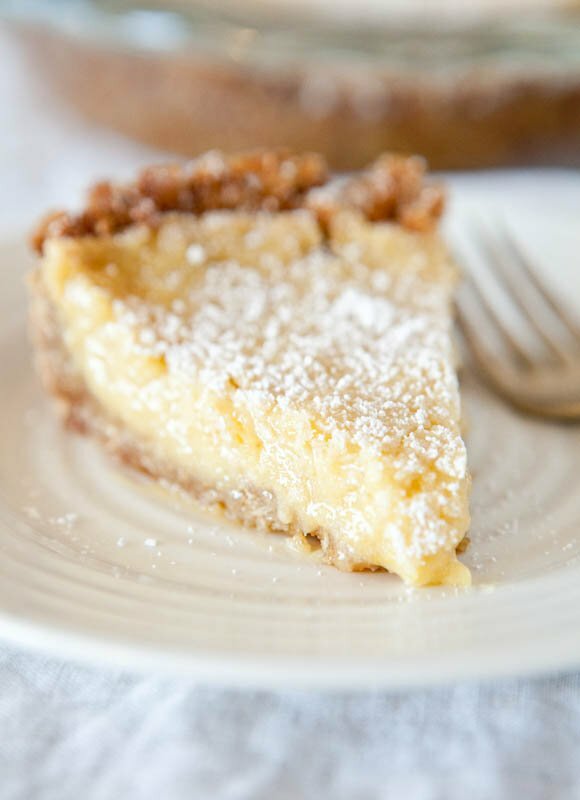 Although Crack Pie was very cumbersome to make, the crust was phenomenal and the filling was to-die-for, and for a special occasion I could envision making it again.